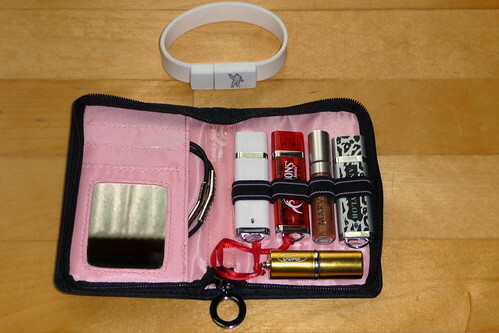 One of the many swag items that I brought home from BlogHer last year is this cute Mary Kay makeup case. But what's that white band around it? A Michelin flash drive? Michelin: ?? I ended up recycling it because it was a pain to open. Since then I've added more drives that I've acquired. Sylvania: 1GB, except it is too wide for my USB hub. Staples: 2GB! !, from the awesome Aiming Low HP/Staples party. It is the perfect case for thumb drives! Forget makeup, this geek prefers flash drives. Only you would think of this brilliance Angela! Ha! As soon as I Opened this post, I recognized those items!! That's a perfect use for that Mary Kay use!